Self promotional cartooning tactics I’ve used over as many years take time, patience and investing money. Nothing comes cheap and it doesn’t with anything involving the publishing business or promoting your cartooning or illustration services. I was reminded recently by stumbling across this old letter from a specialized trade journal that involved circulation management for magazines. 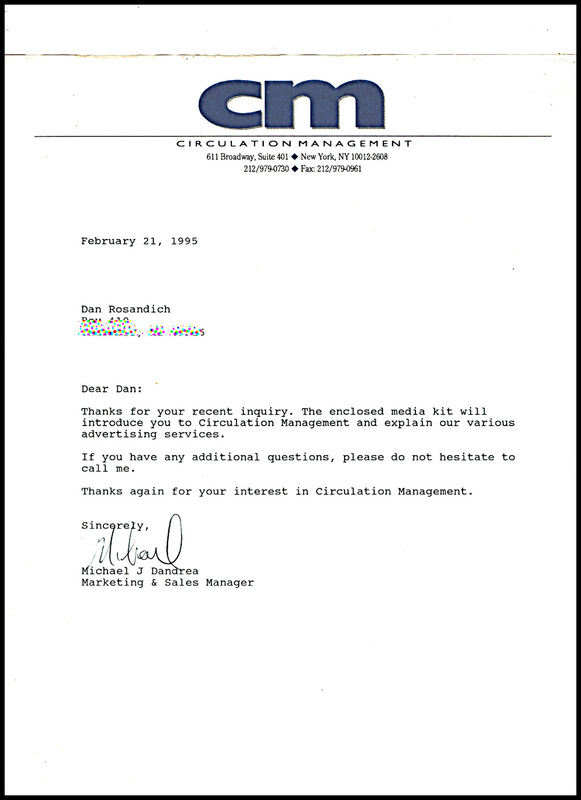 In order to understand my tactic for this promotional method, I’ll set it up by first sharing the letter from Mike Dandrea, the Marketing & Sales Manager for Circulation Management magazine. I never gave thought to even advertising in such a publication, let alone knew Circulation Management even existed. What initially happened is that I was contacted by an advertising copy writer to illustrate some direct mail pieces he was working on. As we got to know each other, I got around to asking him how he finds his publishing clients to get the kinds of assignments he and I had collaborated together on. 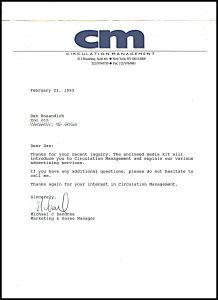 He explained his advertising in a publication called Circulation Management which was a specialized trade journal that was read by editors, publishers and advertising managers at magazines across the U.S. and Canada. My intuitive nature being what it is, the light bulb went off and I realized it would be a unique resource in which to offer and promote my cartooning services. In the days before the internet, there were actually publications like Circulation Management which flourished. This magazine had a respectable readership of roughly 12,000 readers . . . many of which were copy writers. 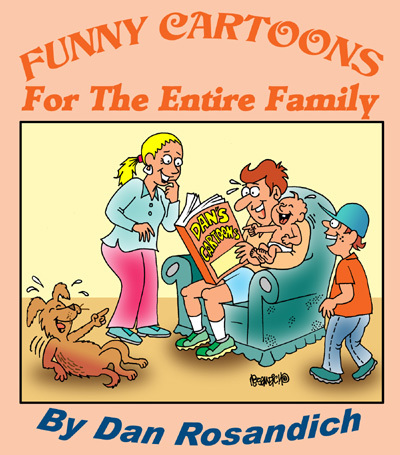 Another good sector in the publishing business which to offer cartoons and illustration services. Go figure. A simple assignment evolves into a simple question that sprouts into yet another advertising and promotional opportunity. Now, you may still be wondering where this particular copy writer found me in the first place. He received one of my promotional brochures I had sent using first class mail to an associate who forwarded my samples onto the copy writer who mentioned Circulation Management. There are or were two ways of advertising in magazines like this. One was by running a “display ad”. This is the more costly type of ad and requires you run a minimum number of ads “per contract”. The second option is running a classified ad. Pricing is or was usually based on the number of words and this was more cost effective. Although the latter wouldn’t allow you to show samples of your work on page. It was a toss up, based on your budget. Overall, I had no complaints with this publication and ran some advertising that paid off and allowed me to collaborate on new ventures I am certain I couldn’t have found using any other technique. Self promotional cartooning tactics also include a combination of these kinds of advertising campaigns and enhancing that with maintaining your own cartoon web site with portfolio pages that professionals can easily find online. Professionals seeking cartoons need to go no further than their desktops or mobile devices in order to find quality cartooning services.